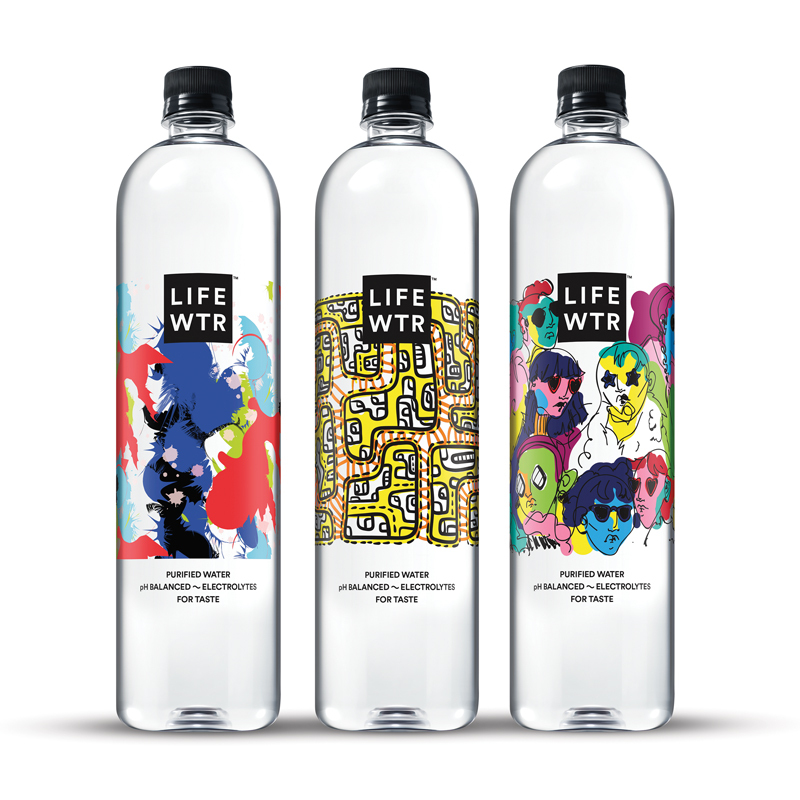 Ever since LIFEWTR hit the shelves in February 2017, it’s become a bona fide hydration obsession. 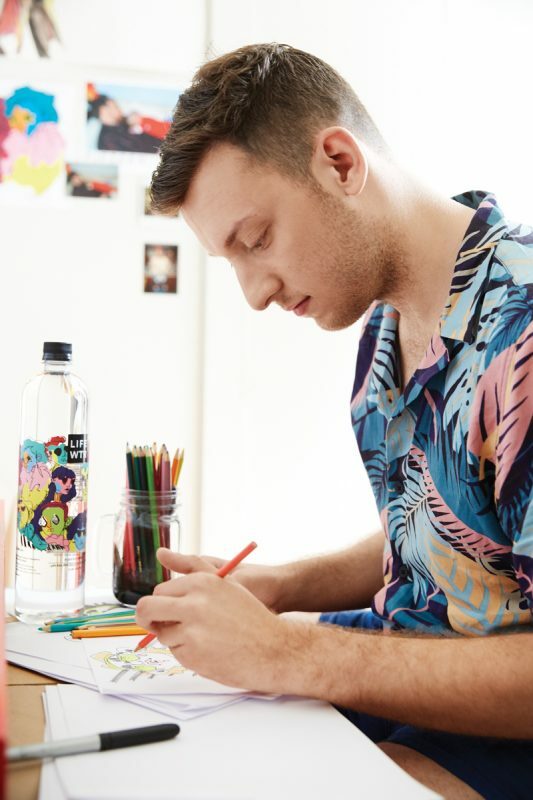 Just in time for fashion week, the brand has partnered with the Council of Fashion Designers of America (CFDA) on its new Series 3 bottles, featuring artwork by Adam Dalton Blake, Tiffany Huang, and Ghazaleh Khalifeh. These talented young designers are members of the CFDA+ platform that supports recent design graduates, and thanks to LIFEWTR, they’re already making quite the splash. This New Yorker spends his 9-to-5 as a designer at Bonobos. On his downtime, he’s perfecting a whimsical, modern take on American menswear. What was your concept for the LIFEWTR artwork? It’s all about seeing the world for all the diversity and color that there is. 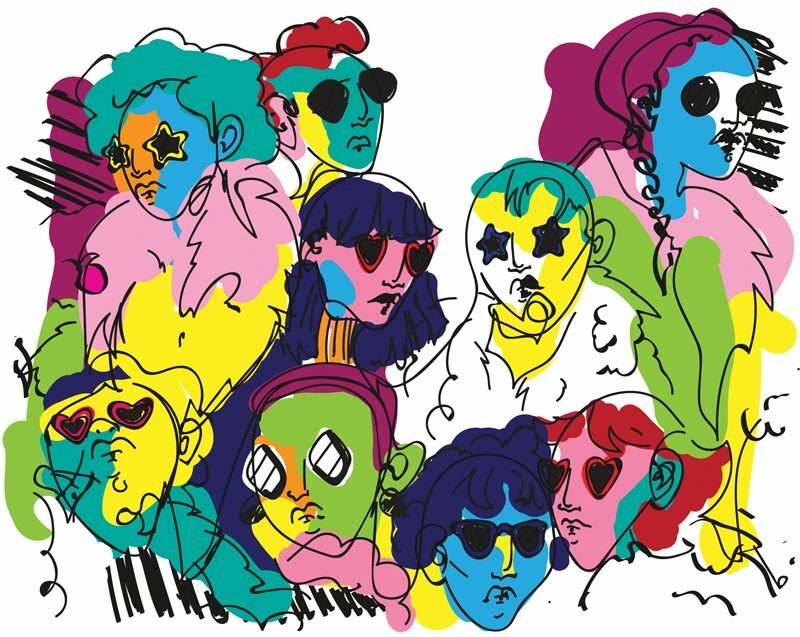 Each of the people on the bottle are interconnected and wearing fun glasses that allow them to see the beautiful and vibrant colors that we are all made of. The art also represents the amazing fashionistas and fashionistos of New York City. What was the biggest challenge you encountered in the design process? Thinking about how to design a print that could act as both a singular graphic for the bottle and a repeat to be printed on fabric. However, it was also freeing, thanks to LIFEWTR, who gave us full reign to figure out what we wanted to do. What appealed to you about the idea of designing packaging that is being experienced by tens of millions of water drinkers? LIFEWTR is so great because they are giving a platform to emerging artists and designers. The idea of so many people carrying around my design, which I incorporated into my first show at fashion week, is an idea that a recent graduate can only dream of! You’ve worked for Robert Geller, Tommy Hilfiger, and Greg Foley. What were the most valuable lessons you learned from them? From Robert, I learned how hands-on you have to be with each of your collections. Also, being nice and smart gets you very far. 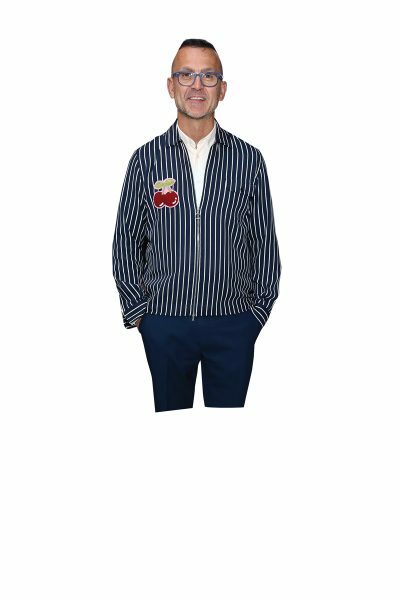 At Tommy Hilfiger, I learned how to be a little cog in a big fashion machine, and what that entails day-to-day. And with Greg, helping with illustrations for his coffee-table book, I learned so much about fashion history, as well as the art of constantly working and reworking to make a final product as good as it needs to be. In addition to designing your eponymous line, you work as an assistant designer of knits and sweaters at Bonobos. What brought you to the company, and what does your job entail? Bonobos is a company that is full of bold prints, novelty fabrics, and great people! It’s so great infusing my aesthetic of bright and fun elements into a company that also has that vibe. 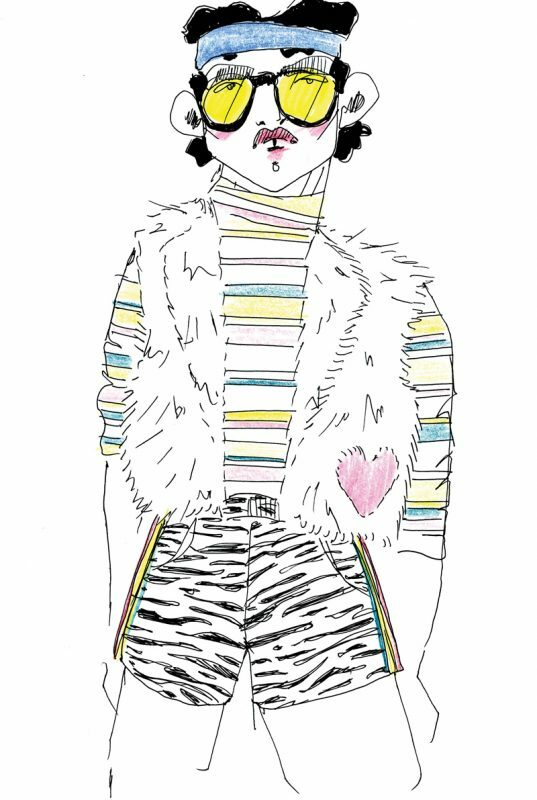 I get to draw embroideries, illustrate new bodies, and create graphics, all with a sense of fun and whimsy. What’s the concept for your Spring 2018 collection? Fifteen, Love! is a contemporary menswear collection inspired by my tennis-playing father in the late 1980s, alongside the kitsch-craft aesthetic of my childhood. This collection has also become a textile and texture exploration using textiles such as latch-hooked yarns, boiled wool, velvet, velvet corduroy, faux fur, and more. On your website, you liken your clothes to a “visual highlighter.” What gives them that quality? There’s a sea of navy, grey, and sometimes maroon in menswear right now, and in that sea, my clothes can be spotted from a mile away. They are full of color, texture, and sometimes even shimmer. After studying fashion and design in both the United States and in Europe, Khalifeh is now making magic from her home base of Marin County, California. You live on the coast. Tell us about your relationship with water! I spend a lot of time along the rugged Californian coast of Marin County, and sometimes spend many days and nights in a beach town, waking and sleeping to the sound of the waves. I spend time not only meditating along the shore, but also foraging natural treasures that leave me in awe of all the divine beauty of this planet! It’s not only grounding to be among a mostly natural habitat, but overwhelming—in a wonderful way—to be reminded of the vastness of the universe. What was your concept for the bottle artwork? I sought to create a print that resembles a splash of water, and chose to use celebratory colors that celebrate the vitality of life, as much of life’s vitality comes from water itself! I also feel the splash of shapes resemble an abstract interpretation of water in the form of wildflowers, as well as the paisleys that stem from my Iranian heritage. It makes the art and design visible to such a broad audience, be it indoors, at a park, on public transportation, and beyond! I believe strongly in making art and design accessible to all, especially to children. The more visible art and design are to the masses, the greater chance there is for it to inspire all of us into a more positive future. Additionally, when the print of a water bottle is appealing, it can beckon one to purchase and consume more water and stay hydrated, which is essential to wellness. What’s the concept for your Spring 2018 capsule collection? It’s inspired by the concept of how beautiful and vital the peaceful coexistence of all cultures and races with both natural and man-made environments is. I explore such concepts on a tactile level from the perspective of my own Iranian heritage, and the nomadic muse rises from it. I imagine this muse stepping beyond borders, to experience a world without them. You recently graduated from Academy of Art University, and you also trained in Paris. What were the most valuable lessons from those experiences? I spent much of my twenties in academia, and one of the many valuable lessons I learned is the importance of building paths toward dreams from the inside-out, and not from the outside-in. When I allowed myself to accept that I’d pave my own design path here, global opportunities that have surpassed my wildest expectations began to present themselves to me. 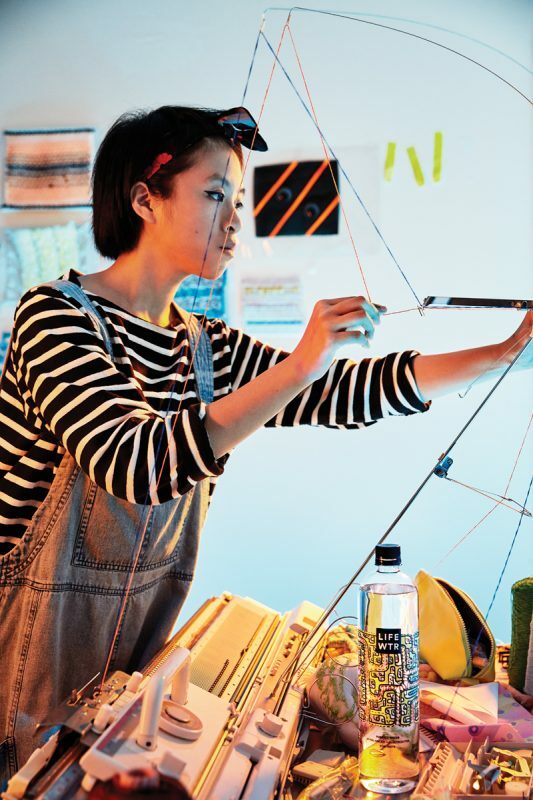 A bona fide textile savant with a penchant for color and texture, the New York-based Huang is making some seriously cool art that looks as great on a water bottle as it does on a dress. It’s inspired by my love for adventure. 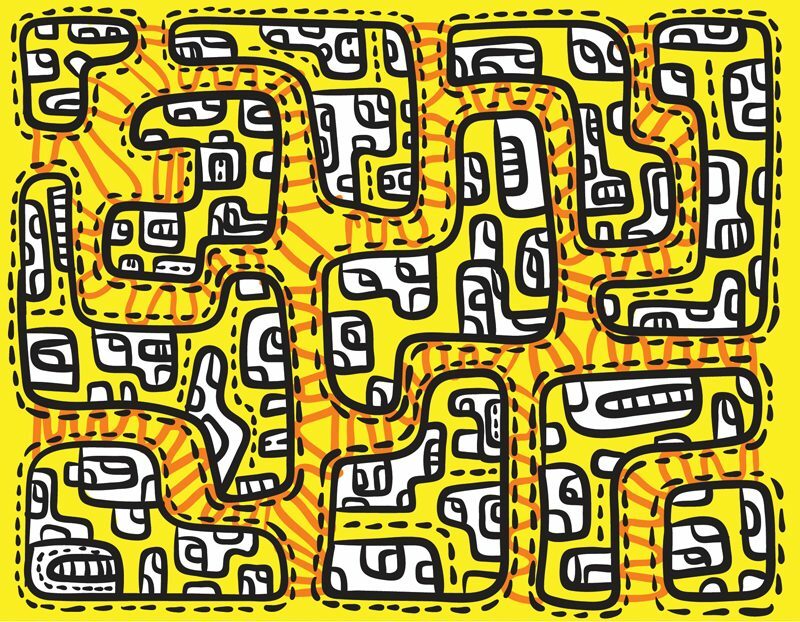 I designed an abstract treasure map print, so when people take the bottle with them, they are inspired to explore their surroundings. How did you select the colors? The dominating color is yellow, which is the meaning of my last name. I find the color very optimistic and cheerful, and I want to communicate this energy. To design a print that is true to my vision, but at the same time interacts with the most important element: water. Many parts of the print are carved out, creating areas of transparency that allow the water to interact with the print. I really love the idea of inviting artists and designers to design the packaging for LIFEWTR while showcasing our work. This makes art more accessible and less intimidating, and hopefully it will inspire more people to create! Much of your work focuses on the way that textiles interact with the human body. How did you integrate that conversation into your work with LIFEWTR? In recent years, water bottles have become a really trendy accessory, and by incorporating my artwork onto the bottles, they also become a part of someone’s outfit. What initially drew you to the medium of textiles? 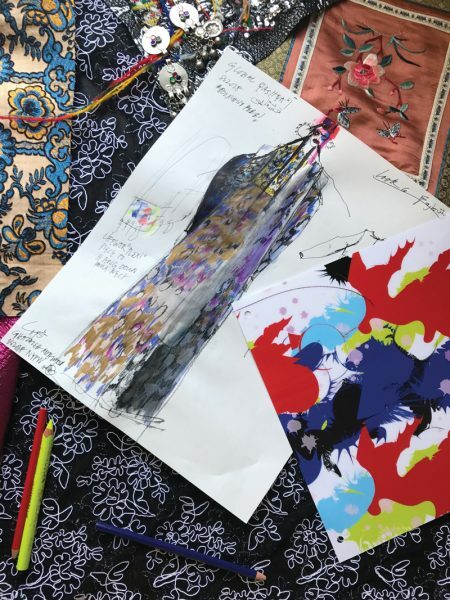 Ever since I was a child, I’ve always been drawn to color and texture; and after enrolling at Parsons [School of Design], I was introduced to this world of textiles, and I was immediately hooked by the idea of creating my own fabric. Being able to learn and participate in a thousand-year-old tradition passed down by artisans is a big honor, and I feel a sense of responsibility to keep these crafts alive. What’s the concept behind ItchyItchy, your new start-up? It was founded by my partner Kailu Guan and me, and we create storytelling experiences that incorporate fashion, technology, and spatial design. We find a huge disconnect between the art and the commercial side of fashion. We try to bring in the idea that fashion creativity can exist in an environment that commercializes the experience rather than the object itself. You’ve won several awards for your work, like the Parsons x Kering Empowering Imagination Award. Where do you see yourself in five years? I see myself continuing to challenge storytelling in fashion, and would love to see ItchyItchy become an event that attracts people to come and interact with clothing, and hopefully attract companies in fashion or other fields to collaborate with us. What’s the concept for your Spring 2018 collection, Umbrella Ghosts? It’s a collection of characters inspired by the Taiwanese superstition that ghosts live inside of umbrellas, and opening one indoors will invite the ghosts into one’s home. The collection explores various universal fears through the eyes of each character. Each look has a print that acts as an augmented reality trigger, which opens the virtual reality space, allowing the audience to explore the worlds of each character and confront their fears. It’s already proving itself to be a big success, not only in the art and fashion communities, but to consumers at large, mainly thanks to the fact that we are a purpose-driven brand. Our audience is very intrigued by the cultural angles and subjects that we cover, and also very excited to support the emerging artists and fashion designers whom we’ve put at the forefront. What’s the focus for Series 3? 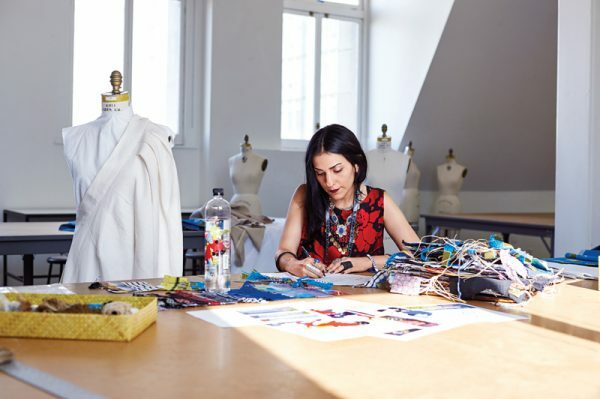 We’re really zeroing in on the fact that there are so many talented fashion school graduates out there, but only a fraction of them manage to not just make it in the fashion world, but build their name and create their own label. How did LIFEWTR and the CFDA team up? Even before LIFEWTR was in the marketplace, we were talking to the Council of Fashion Designers of America about what the future could be like if we were to join forces. We really believe that fashion is one of the strongest expressions of living art. And the CFDA, in turn, is an organization that is fully committed to supporting fashion talent at different stages of their development. We both see the partnership as very organic, authentic, and true to the goals and vision of both partners. How do these three designers complement one another? They are united by absolutely amazing talent, true passion behind what they do, and commitment to making it. How has the art world responded to the LIFEWTR platform? Thanks to our commitment to the world of art, and our relationships with different incredible partners such as the CFDA, we were able to build something the art world has truly started to take notice of. We are now the official water of the Frieze Art Fair. We’ve launched an endowment fund with them for the Brooklyn Museum, with LIFEWTR picking up the purchase of one of the major works out of the Frieze Art Fair and showing it in the Brooklyn Museum. It goes to show that our commitment is really backed up by our actions, and it allows us to build a reputation that we are proud of. What can you tell us about the LIFEWTR show that’s happening during New York Fashion Week? I liken it to being given a Superbowl opportunity right out of college! [Laughs] LIFEWTR, along with the CFDA, is providing support for these designers to showcase their debut NYFW Spring/Summer ’18 collections. The looks will feature prints that are also seen on the bottles, as well as other pieces they have brought to life. 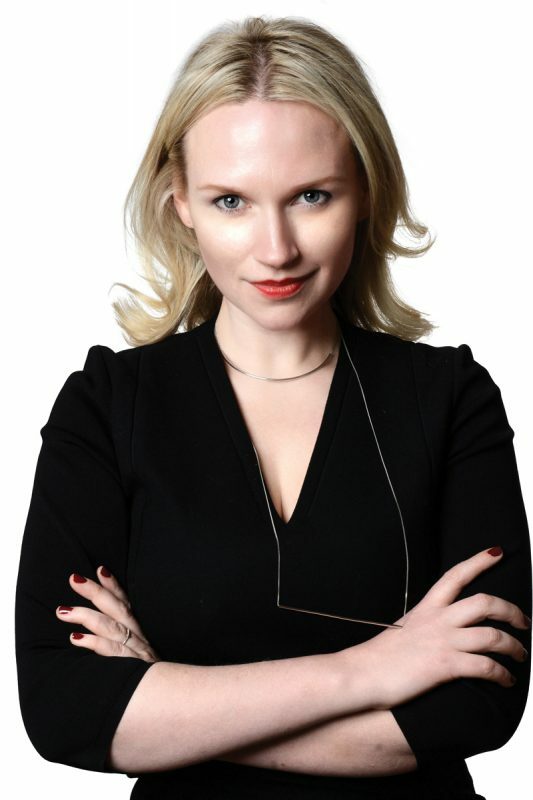 How did the CFDA+ program come together? In 2013, the CFDA launched CFDA+ as a platform for the best graduating talent from top schools around the world. Our aim was to connect emerging designers to industry opportunities, and provide our 500-plus membership with access to top talent. The CFDA and LIFEWTR Series 3 NYFW presentation brings this support to the next level, providing visibility, mentorship, and professional opportunities to three CFDA+ alumni. What does membership in the program entail? CFDA+ spotlights the best of graduate talent globally. Each year, designer selection begins with an academic nomination, followed by a portfolio review, a CFDA interview, and a final committee selection. In 2016, we received more than 250 applications from about 30 leading fashion programs. We selected 51 CFDA+ design graduates who were highly creative, visionary, and skilled in specializations, including apparel, textiles, accessories, jewelry, and who showcased an interest in technology, sustainability, and other emerging areas in fashion. What appealed to the CFDA about the work of Adam, Tiffany, and Ghazaleh? Each demonstrates a unique design ethos. Adam has a love for humor, color, and American textile craft techniques like latch hooking. Tiffany is all about technology and fashion futures, including augmented reality, while Ghazaleh’s work begins with authentic, handcrafted, upcycled textiles. In addition to sustainable materials, her work also focuses on co-creation and multicultural diversity. Why did their aesthetics align well with LIFEWTR? LIFEWTR’s philosophy is centered on advancing creativity, art, and design as a source of inspiration. Adam, Ghazaleh, and Tiffany all share one thing in common-—talent. Their ease with color, graphic, and print, and their vision, energy, and dynamic creativity are a perfect fit for LIFEWTR. How do these kinds of collaborations serve emerging designers? By partnering with LIFEWTR, we are able to provide three CFDA+ designers with the invaluable opportunity to show their work as part of NYFW. The early visibility, exposure, and mentorship can help propel these talents to the next level in their careers.